Breadfruit mealybug, probably originally from India and Pakistan, was responsible for huge crop losses in breadfruit, a staple diet on the coral atolls of a number of Pacific nations. Damage lead to crop failure and often tree death. Insecticides could not be used for fear of polluting water supplies. Research in tropical Australia uncovered a predatory ladybird beetle, Rodolia limbata Blackburn, in the Northern Territory. After it was tested for safety for introduction into the Pacific, the beetle was introduced in the Federated States of Micronesia (FSM) where control of the mealybug was spectacular. 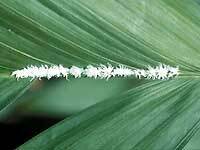 This success was repeated in Kiribati, the Marshall Islands and Palau where similar problems have been caused by the mealybug.